My mind is quick to associate Sri Lanka with tea, and that’s because over just a century and a half, tea has completely transformed the land, economy, and in many ways, the social and political structure, of central Sri Lanka. Tea arrived with colonization by the British, who planted it on every last available space. In doing so, they created the visual of Sri Lanka I now draw on. My first real glimpse of tea country was on our last night in Kandy, when we drove up into the hills. Up, and up, and up, until the narrow but well-paved road gave way to tracks, and we all agreed we’d gone high enough. In just 20 minutes, we were away from the city’s hum and into quiet rural villages, each made up of small, well-kept homes with corrugated tin roofs. In the same kilometer we saw a Buddhist temple, Hindu temple, and Christian church, and drove past a large, red-earthed cricket pitch with a game in full swing. We passed a gathering of people who listened to a man with a clipboard, all of them surrounded by sacks of tea leaves - the results of their day’s work. Of course, that’s the other thing we saw: hills of tea, stretching out eternally. It was my first opportunity to examine, up close and in its purest form, the thing I’ve sipped nearly every morning for the past decade - a drink that brings me so much comfort. As a shrub, tea looks like something I might have found in my Grandparents’ garden, with the leaves themselves reminding me of fresh bay leaves. At the time, it was hard to imagine how they’d become the dried, black, aromatic bits of matter that I infuse into hot water daily, but I’d learn all that later….. 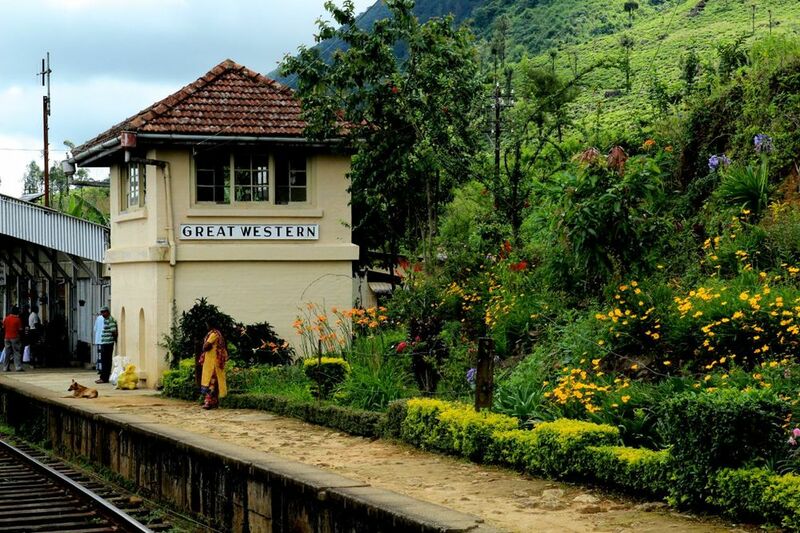 The next day, we boarded a train and headed towards Bandarawela, a 7-hour journey famous for its grand displays of Hill Country. But as it turns out, it was even more-so. I found myself torn between a desire to capture it on camera (an impossibility, of course), and wanting to experience it in the moment, camera in lap and jaw agape. At one point, we came around a corner and a ridiculous scene revealed itself: there was a colourful village, sun-dappled hills of tea, a small valley, trails of red earth, and a waterfall. I think I actually said, "Oh come ONNNN" out loud. When we pulled into each station, vendors approached the train, hollering the name of their ‘short eat’ snacks on offer. My favourite call was the incessantly rolling “wadi-wadi-wadi-wadi-wadi-wadi-wadiiiiii” for ulundu wadi, which are savoury little fried donuts. Halfway through the day, I purchased a bag of fried peanuts and curry leaves. Can I say, oily hands down, those spicy nuts + crunchy curry leaves were my favourite snack of the trip. Another big gold star for curry leaves. This entire post – all of it – is just to say this: if you go to Sri Lanka, take the train from the Kandy to Bandarawela, and bring money for snacks - it’s a journey that just can’t be beat. And those peanuts! Much more on tea to come…….